When I began collecting pressed glass I did not think I would find many pieces dating from the beginnings of this new technology. That is why I chose "1840 to 1940" as a subtitle to my website. Everything produced around or before 1840 - as I thought - was left out and landed in "Chapter Zero". In the last few years, however, the main focus of my interest shifted and the number of very old pieces of pressed glass in my collection has increased considerably. The arrangement and the numbering of the pieces became more and more confusing, the texts especially needed an update. New books on early Belgian and French glass production have appeared. A magnificent book, published 30 years ago, Joseph Philippe's Le Val-Saint-Lambert. Ses cristalleries et l'art du verre, came to my eyes only recently. Important early catalogues and tariffs of Belgian and Swedish glassworks, hidden in archives on both sides of the Atlantic , have surfaced. As it is, the short chapter has turned into a "book" of its own. I organized it anew, the arrangement of the pieces follows the order found in old catalogues - more or less. The pieces have been photographed anew and the texts were rewritten, now containing all the new information I have gathered. However, all the pieces attributed to certain glassworks can be found in early tariffs and catalogues in a part named "Moulure en plein" or "Cristaux moulés en plein". In 1827, the term "Moulure en plein" is used for the first time in the official report of the exhibition of French industrial products. Baccarat was awarded a gold medal for its products among which were "des cristaux moulés en plein, dont les prix n'excèdent que de peu ceux des [cristaux unis et à moulures simples]". The report does not amplify the term; perhaps Baccarat was not interested in revealing details of the new technology. Miriam E. Mucha translated the term with "fully molded", meaning, that form and pattern were produced in one operation. She has convincingly argued that moulure en plein is made possible by the use of the Robinet piston. A sharp definition of the pattern on the outer surface of the object could only be achieved by pressure blowing. The exact date of the invention is not known, Bontemps (op. cit., p. 569) writes that it was in 1821, Péligot (op. cit., p. 401) in 1824. In the reports of 1827 and later there is no mention of the tool or the name of its inventor. In their catalogues the glassworks themselves did not make a difference between "moulure par soufflage" and "moulure par pressage". 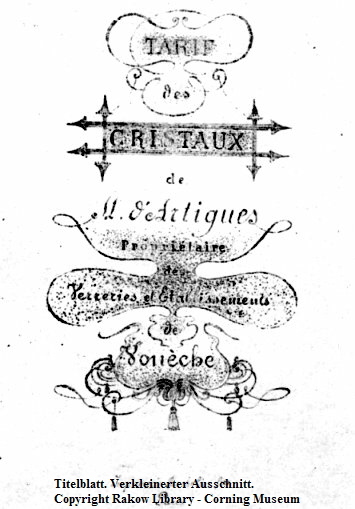 The terms "moulure en plein" or "cristaux moulés en plein" are used in the Launay Hautin catalogue of 1841 as well as in the two tariffs of Val-Saint-Lambert in 1843 and 1847. There exist three undated tariffs from the 1820's/early 1830's that refer to the term "Moulure en plein". The earliest might be the Tarif des Cristaux de M. d'Artigues. Propriétaire des Verreries et Etablissements de Vonéche. Imprimerie Bachelier fres. Paris. The arrangement of the leaves is rather erratic. A comparison with two other tariffs allows an exact collation. 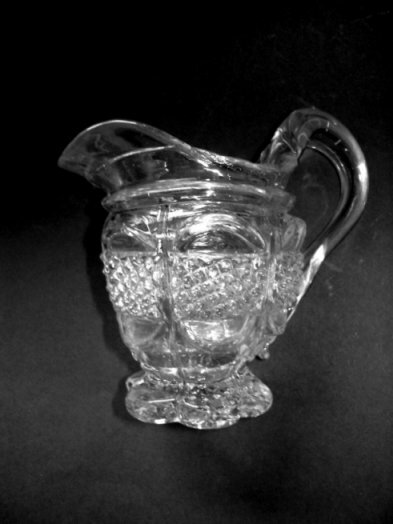 With the exception of a "sugar water set" (Verres d'eau) that appears in both parts (in different patterns, though), there are no services, but single pieces of what was to become "Service à Bambous", "Service à Diamants et Feuilles", "Service moulé à raies", "Service à carrés de diamants et filets" and "Service moulé à diamants biseaux" in Baccarat, Saint Louis and/or Val-Saint-Lambert. Unlike later tariffs or catalogues, this one has - with one exception - usually only one size for carafes or gobelets. (The exception is "Gobelets Cylindriques, à Bambous taillés à perles" (p. ) which come in 8 sizes).Whereas these patterns appear more or less unchanged in later catalogues, two other patterns, "draperies" and "feuilles de laurier", both very popular in cut glass all over Europe, are distinctly different from those in later catalogues. Whether the d'Artigues tariff refers to the programme of Vonêche is discussed controversially - see Bicentenaire , p. 158. The implication inherent in my title, that the technology of pressing glass was developed first in Vonche, is a little risky. This will be discussed in a later article. The developing and perfection of mechanical pressing in France must have taken place between 1827 and 1834. The rapport of the 1834 national exhibition hails a new technology, "le moulage ...par une forte pression", as "un grand progrès ... depuis la dernière exposition" and a "procédé ...véritablement industriel". (Loc. cit., p. 393). The pieces presented in this chapter have a sharp imprint of the pattern on the exterior surface (with one exception, s.b.). Inside, one can, if possible, easily feel the negative of the pattern - but not as distinct as in free blown patterned pieces. Hollow glasses, whether for water, wine or liqueur, often have a smaller diameter at the upper rim than at the widest point of the body. They were pressed into a form by means of the Robinet piston. The exception mentioned is the creamer 05.29. The diamonds on the outside and underneath the foot are blunt, the forms of the leaves or scales and the vertical notches can easily be felt on the interior surface, even the diamonds appear as small depressions on the inside. The creamer, as well as the handle which was added after the pressing, must be freeblown. And, most likely, it was fully blown in one operation: the cavity of the middle part reaches into the foot; the upper rim shows traces of the shears with which the excess glass was cut off. The work done by hand that was applied to the creamer is finely illustrated, step by step, on p. 24 of the McKearins book on American Glass. The other pieces in the chapter are mechanically pressed. Another characteristic of these early pieces is that they are, partly lavishly, worked on by cutting. Since all blown pieces, whether freeblown or mouldblown, had a cap that had to be taken off, the rims formed a straight line. Most of the plates and bowls have plain rims ("bords unis" in the catalogues). Any form of serration ("bords festonnés" or "bords dentelés") had to be added by cutting. (See bowl 03.06) Many decanters are faceted on the shoulders and the necks. Decanter no. 01.13 is likely to have had small horizontal rings all over originally. They were separated by vertical facets after being moulded. The neck rings sometimes have fine notches. The "pearls" in the bambou pattern are always added by grinding and polishing. The stopper of carafe no. 01.14 is a work of art in itself. Finally, I should like to thank all who have provided material to this chapter, first of all Dr. Manfred Franke and Mr. S. Geiselberger for the Launay Hautin catalogues. Special thanks go to Maja and Björn in Växjö/Sweden who introduced me to the treasures of Smålands Museum, also the hidden ones, and provided me generously with material on Swedish glassworks in the 19th century. The Victoria & Albert Museum in London let me have photocopies of the 5 early tariffs/catalogues of Val -Saint- Lambert; the Rakow Library of the Corning Museum a copy of the d'Artigues tariff. The Conservatoire National des Arts et Métiers (CNAM) did a great job by making available to the pressed glass aficionado the Rapports of national and international exhibitions in Paris in the 19th century. Miriam E. Mucha's article "Mechanization, French Style. Cristaux, Moulés en Plein", published in The Glass Club Bulletin, No. 126, Sep 1979, pp. 1-8, is still a must-read. Joseph Philippe. Le Val-Saint-Lambert. Ses cristalleries et l'art du verre en Belgique. Liège, 1974. Jacques Toussaint, ed. Bicentenaire de la cristallerie de Vonche 1802-2002. Namur, 2002. Jacques Toussaint, ed. Patrimoine verrier en Namurois. Namur, 1997. L'âge d'or du verre en France 1800-1830..., Alençon, 2001. Georges Bontemps. Guide du verrier. Traité historique et pratique de la fabrication des verres, cristaux, vitraux. Paris, 1868. Vonêche and Beyond (German pages).